PHUKET: A Chinese couple arrested for working illegally as tour guides in Phuket have been charged with offering a police officer B100,000 as a bribe to let them go. 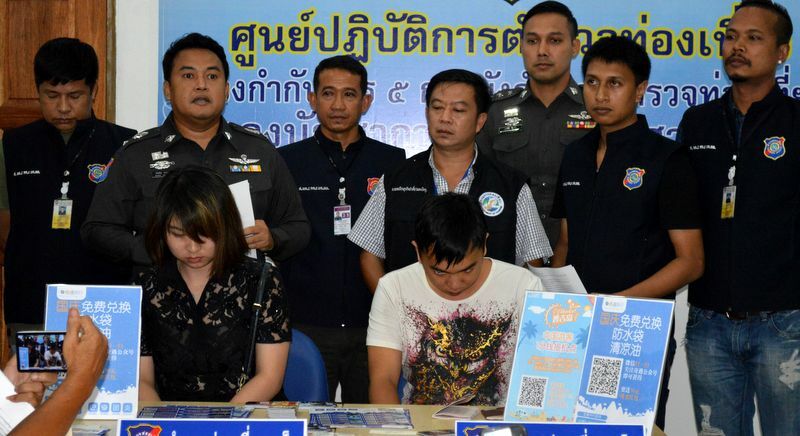 Chinese nationals Wu Wenheng (seated, right), 24, and Chen Boran (seated, left), 25, were both charged for attempting to bribe a Phuket Tourist Police police officer. Chinese nationals Wu Wenheng, 24, and Chen Boran, 25, were presented to the press by Phuket Tourist Police Deputy Superintendent Pol Lt Col Bundit Khaosutham and Ministry of Tourism and Sports Phuket office Director Santi Pawai yesterday (Oct 6). The pair were arrested at Chalong Pier after officers, acting on a tip-off, recorded video evidence of the couple handing out brochures and tour packages to tourists. “Some packages required Chinese tourists to download the WeChat application and scan in QR codes to receive free rewards as incentives,” Mr Santi explained. While the couple was being placed under arrest, they attempted to bribe the arresting officer by offering him B100,000 to let them go, Mr Santi explained. “The officer, Snr Sgt Major Surin Pitpan of the Tourist Police, accepted the bribe money so that it could be recorded as evidence, then handed over the money,” Mr Santi said. Seized from the pair as evidence were tour brochures, printed pamphlets, drink coupon cards and the offending B100,000. Wen and Chen were both charged with working illegally as tour guides, illegally living in Thailand, and attempting to bribe a police officer.